Everest is a story about a guide leading a daring group up to the mountain and back down. The key thing mentioned in the film is that going up is not really the hard part but after your body is drained of its energy, the adventure back down is more brutal and exhausting and quite scary. Rob Hall (Jason Clarke) is the guide paid to take them up and bring them back down safely. This story depicts real events that happened on May 10, 1996 and the tragedy that befell them. Two crews make it up and suddenly a huge storm that wasn't supposed to hit caused heavy snow storms and icy cold temperatures. The battle for survival starts. Everest starts out with the guides and the climbers — you get to learn each of their back stories and connect with those characters. Not only do they have to climb Everest but the journey to the base of the mountain is a hike in it of itself . The movie made you want to take the challenge of going up Everest's peak or stay home, warm, and out of harm's way. My point of view was stay home and if you choose the same after watching this film I wouldn't blame you — Everest was gut wrenching and sad. There are gleams of hope but don't rely on that too much. 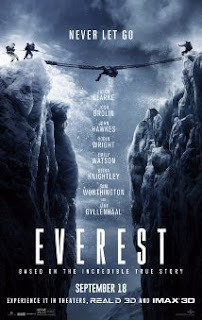 I would suggest seeing Everest in Imax because a bigger screen was meant for a film like this. Also get some hot water for hot chocolate going when you get home just in case you leave feeling cold. Snowfall is just around the corner and Everest reminded me of that. You'll enjoy it and the characters. Now go and find out if everyone makes it out alive or if some perish.